People can change. In the long record of human history, we learn that there are no generalities or absolutes to describe human behavior. Human beings have shown a tremendous capacity to improve their behavior and progress over time. A great example of this is the history of the seat of the Papacy and by analogy Europe itself. For the past several centuries the papacy has enjoyed enormous respect in every quarter of the globe, partly because most 19th and 20th century popes have stood for and publicly defended basic principles of liberty, justice and humanity in a tumultuous world. But there were growing pains; the Cadaver Synod illustrates just how far the institution has come. 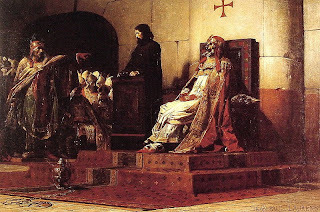 The Cadaver Synod occurred sometime in January 897 in the Church of St. John Lateran, the pope's official church in his capacity as Bishop of Rome. The defendant on trial was Formosus, an elderly pope who after a reign of five years had died April 4, 896 and been buried in St. Peter's Basilica. The trial of Formosus was ordered by the reigning pontiff, Stephen VII, who had been prodded into issuing the order by a powerful Roman family dynasty." Although Formosus had been, according to McBrien, "a man of exceptional intelligence, ability, and even sanctity, he [had] made some bitter political enemies ... including one of his successors, Stephen VII." No trial transcript of the Cadaver Synod exists. Nonetheless, it is reasonably clear what happened. Sitting on a throne, Stephen VII personally presided over the proceeding. Also present as co-judges were a number of Roman clergy who were there under compulsion and out of fear. The trial began when the disinterred corpse of Formosus was carried into the courtroom. On Stephen VII's orders the putrescent corpse, which had been lying in its tomb for seven months, had been dressed in full pontifical vestments. The dead body was then propped up in a chair behind which stood a teenage deacon, quaking with fear, whose unenviable responsibility was to defend Formosus by speaking in his behalf. The presiding judge, Stephen VII, then read the three charges. Formosus was accused of (1) perjury, (2) coveting the papacy, and (3) violating church canons when he was elected pope. The trial was completely dominated by Stephen VII, who overawed the assemblage with his frenzied tirades. While the frightened clergy silently watched in horror, Stephen VII screamed and raved, hurling insults at and mocking the rotting corpse. Occasionally, when the furious torrent of execrations and maledictions would die down momentarily, the deacon would stammer out a few words weakly denying the charges. When the grotesque farce concluded, Formosus was convicted on all counts by the court. The sentence imposed by Stephen VII was that all Formosus's acts and ordinations as pope be invalidated, that the three fingers of Formosus's right hand used to give papal blessings be hacked off, and that the body be stripped of its papal vestments, clad in the cheap garments of a lay person, and buried in a common grave. Further trials of this nature against deceased persons were banned, but Pope Sergius IllI (904–911) reapproved the decisions against Formosus. Sergius reportedly had the much-abused corpse of Formosus exhumed once more, tried, found guilty again, and beheaded, thus in effect conducting a second Cadaver Synod. Some may say if this were done by another people their acts would have been condemned for eternity and their behavior would have negatively branded their whole people perpetually. However, the ability to reform from within surely played a large role in reviving the reputation of this institution and it’s people and there is no doubt that any people must go through trials and tribulations as they grow. Yes, the institution went on from there to engage in genocide (against the Cathars of Southern France), “witch”-burnings and instituted the even more gruesome Inquisition but those days are long gone and now the Papacy enjoys a solid reputation as the seat of Saint Peter. 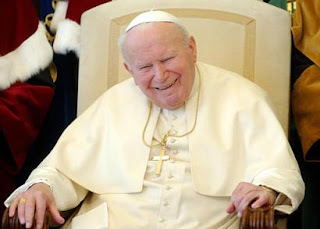 Pope John XXIII, for example, who reigned from 1958 to 1963, is one of the most beloved men of all time, and John Paul II, whose pontificate began in 1978, was not only one of the most admired men in the world, but also one of the greatest figures of the 20th century. WOW! I am trying to reconcile the abhorrent violence with the peaceful teachings of Jesus Christ.